This sterling silver belly bar features a round claw set light blue jewel, and has a 10mm surgical steel barbell. The light blue stone which is held in place by a fancy sterling silver claw setting measures 8mm (approx). 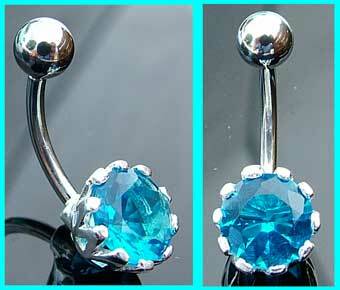 These belly button bars are also available in clear, light pink, sapphire blue and green. The best eCommerce software by ShopFactory powers P12317. All-in one eCommerce and shopping cart software.